In a distant time-so far in the future that either due to global warming or technological progress wind turbines are going swimmingly in the Antarctic climate-sea level rise and resource consumption force mankind to invest heavily in polar research. the Scientific Committee or Antarctic Research is faced with an increasingly creative interpretation of the Antarctic treaty System. 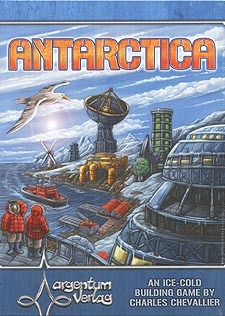 Your objective is to build research centres in Antarctica and to mine resources-for research purposes only, of course. The sun mover counter-clockwise above Antarctica, thawing ships which can be used for scientific progress. At thee end of the game, you will receive victory points for all sorts of majorities.Will your team be the one that gained the greatest fortune.. um, contributed the most to rescue mankind?